My TransAtlantic flight was fantastic ! We traveled from Florida to France for the first time and had a great experience with Norwegian. 40% of Norwegian Air passengers were over 60. The most popular flight route for Norwegian Air was - Los Angeles to Barcelona. The top travel destinations for Norwegian Air passengers were Barcelona, Los Angeles, Oslo. The most popular airport for Norwegian Air was Oslo Airport Gardermoen. Norwegian Air has started direct flights to Europe from three new North American airports- John C. Munro Hamilton International Airport; Miami International Airport; and San Francisco International Airport on 31 March 2019. The airline is currently operating at Miami and San Francisco airports to offer nonstop flights to London, while Boston has commenced a direct route to Rome. The airline has also started operating additional flights from Boston Logan International Airport. All new U.S routes will be operated on the 787 Dreamliner aircraft. Norwegian Air announces the launch of new direct summer seasonal flights from Chicago to Barcelona and NYC to Athens! Norwegian Air has announced the launch of new direct service from Chicago to Barcelona and New York City to Athens for the 2019 summer season. Flights from Chicago to Barcelona will commence from 7th June 2019 while the flights from New York City to Athens will commence from 2nd July 2019. Both flight routes will be operated until 26th October 2019. Founded in the year 1993, Norwegian is the 6th largest low-cost air carrier in the world. Headquartered in Fornebu, Norway, the airline has its operating bases at various locations. Some of these include Alicante, Barcelona, Copenhagen, Edinburgh, London, Los Angeles, New York-JFK, Paris, Rome, & more. The airline has 4 subsidiaries - Norwegian Long Haul, Norwegian Air International, Norwegian Air UK, & Norwegian Air Argentina. The airline offers flights to 150 destinations in U.S.A., south America, Europe, North Africa, the Middle East, Asia, and the Caribbean. 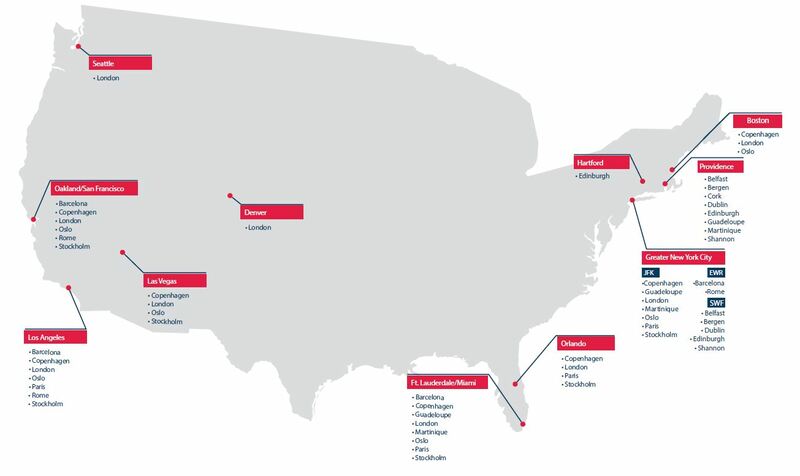 Some of the destinations where Norwegian flights fly to include Chicago, Florida, Geneva, Lisbon, Madrid, Malta, Munich, Oakland, Prague, Seattle, and more. At present it has a fleet of around 150 aircraft & plans to add nearly 250 aircraft in the coming years. All passengers buying Norwegian tickets are permitted to carry 1 carry-on bag including 1 personal item such as handbag/laptop bag. Infants are not entitled to hand baggage allowance. However, baby food & milk in reasonable amount is permitted. The airlines offer checked baggage facility to its passenger. However, it varies depending upon the ticket type. In case of infants, up to 5 Kgs of checked baggage is permitted. Passengers are permitted to carry excess baggage by paying for it. However, the price may vary depending upon the flight/route of travel. For smooth travel experience, airlines aid with specially-abled passengers. However, the airline should be informed in advance. The airline allows sports equipment such as Skis, snowboards, surfboards, bikes, & more. However, remember to check the baggage restriction for each of these. Musical instruments are permitted by the airline depending upon their weight & dimensions. There are different fare categories offered by the airlines. Web-check-in facility depends on which fare category you chose. Also, web check-in is not available for unaccompanied minors, specially-abled passengers, & those traveling with pets/sports/musical equipment. Norwegian Air Hub - Airports used as transfer points to get passengers to their intended destination.